Since 1996, Fuzzy Navel has been a favorite beauty salon offering both excellent styling of natural hair and fine high-quality wigs. For more than seven years, Fuzzy Navel has been a local Los Angeles favorite beauty salon for bridal make up, hair, and nails. 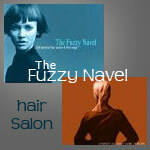 Grand Opening: New second location - Fuzzy Navel The Beauty Zone - in the Valley.